Officials from Pakistan have brought the Indian pilot captured from a downed plane to a border crossing with India for a handover. 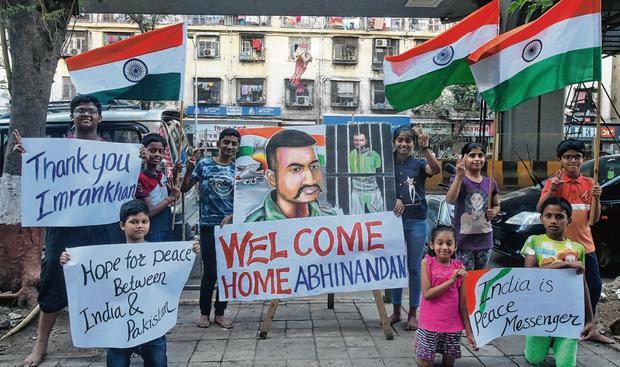 The pilot, identified as Wing Commander Abhinandan Varthaman, was taken in a convoy that set out from the eastern city of Lahore to the border crossing at Wagah, escorted by military vehicles. On the Indian side of the border, policemen lined the road as a group of cheering Indian residents from the area waved the national flag and held up a huge garland of flowers to welcome him back. Pakistan's Prime Minister Imran Khan yesterday said the pilot would be released, to the relief of many Indians, even as his military reported that four Pakistani civilians had been killed by India firing across the disputed border in Kashmir. "As a peace gesture we will be releasing him tomorrow," Mr Khan told Pakistan's parliament yesterday afternoon. Lawmakers thumped their desks in response. "We will celebrate his release tomorrow," said Vinay Bhardwaj (34), a plumber in Nawshera, a border town in Indian-controlled Kashmir. "People are very happy about that here."